Loved ones will never forget Nathan Spoor's beautiful smile. 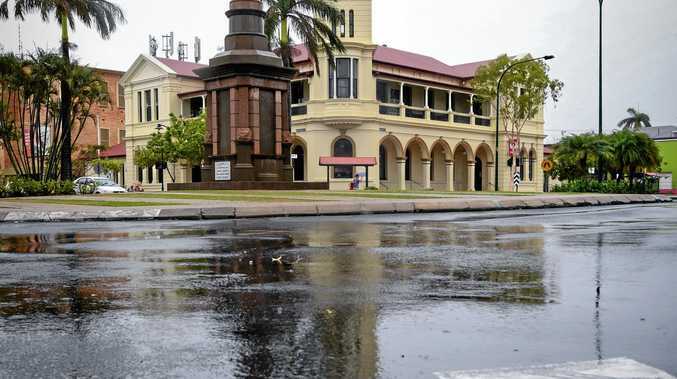 TWELVE months ago today, Bundaberg received some tragic news. 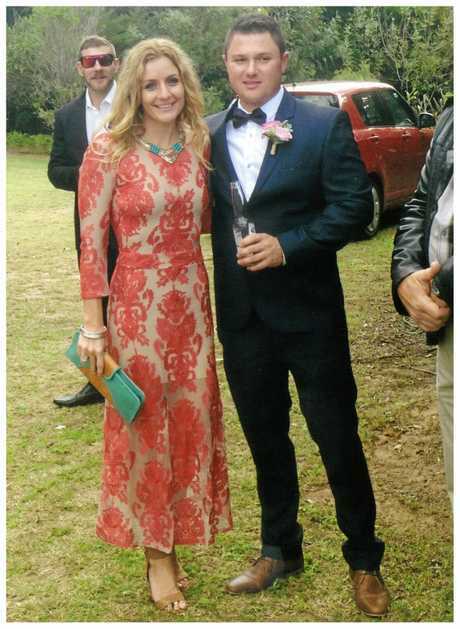 Young businessman Nathan Spoor had lost his life in a boating accident. The news shook the community, as relatives and friends struggled to come to terms with the loss of someone whose enthusiasm for life was so infectious. Now a year after the accident, his family has decided to share their memories of Nath - a guy whose aim was to "spread more smiles than tears". "I will never be the same," Nathan's Mum Nerida says, as she wipes away tears. "It changes your whole outlook on life." The death of her son has been a heavy burden to bear for Nerida, husband Keverne and their daughters, Nathan's sisters, Lucinda and Emmalise. The memory of that day, the phone call and the plane trip - not knowing what had happened except her son was missing - is something that will never leave her. Time has done little to dull the ache as they try to get through each day the best they can. "I do miss those phone calls four times a day saying 'Mum, what are you doing? Let's go for tea at Sizzler'." Nathan Spoor and Suzie Thomas. Growing up, Nerida said Nathan was adventurous and full of life. Some of her most precious memories are of visiting Nathan when he was working away, even travelling to Melbourne for a coffee expo. "I loved being with him. He always made me feel special," she said. His way with people is something Nerida says will never be forgotten. "Nathan was a person that drew people towards him. He was always willing to help anyone in any situation. He would see the best in everybody, nothing was ever too hard. He was always there to help out," she said. The business of baking was a family affair. Nerida and Keverne bought their first store in Mundubbera in 1980 and three years later Nathan was born. Then in 1986, the family moved to Bundaberg. A few years later, the family started the first Brumby's stores in town and, in 1997, Nathan began an apprenticeship at the former Sugarland store. For Nathan and his sisters, bakeries were a part of life. Nathan Spoor baking at Rise The Bakehouse. "I was always cooking and from a very young age Nathan was on a chair helping cook cakes and biscuits and licking the beaters," Nerida said. 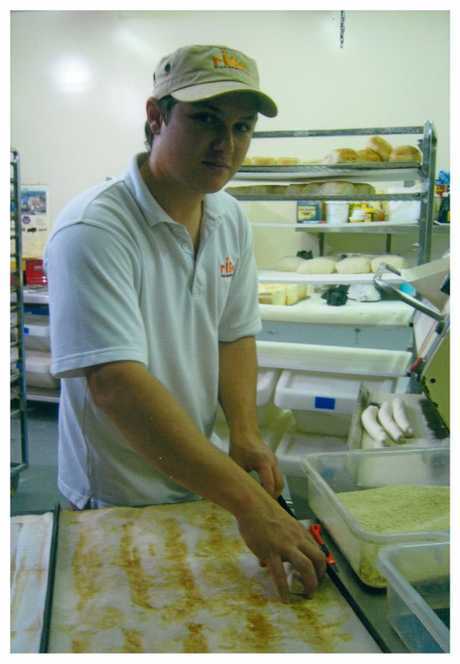 "Even when we had the Mundubbera bakery and he could toddle, he was with the bakers. They used to dip his hands in the whipped cream, them dip them in hundreds and thousands and get him to lick his hands. I would come back to see what he was up to and nearly faint. My goodness, he would have a big grin on his face." After Nathan's death, the couple made the difficult decision to sell Rise the Bakehouse - a store Nathan had poured his soul into and where he would often be found standing out the front chatting to his customers. However it was a decision Nerida says Nathan would have approved of. "He would have said 'Mum, if it's too hard, sell it.'" But baking was not Nathan's only passion. He was also a bit of a daredevil and loved his sports, including motocross and cricket. 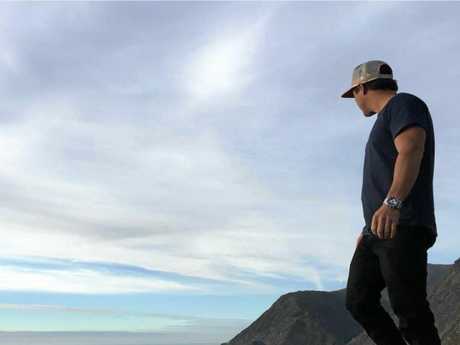 He was an adventure-seeker, always looking for that next great experience. His great loves in life were racing, baking, his 80-head of cattle and, of course, his beloved family. "Nathan always made us feel so special with his beautiful words and affection," Nerida said. She remembers the first time Nathan introduced her to partner Suzie. "We were away for the night and we came home early to find a beautiful pair of shoes at the front door. It was locked, so we knocked on every door but there was no answer. "Eventually he sheepishly came out. And, typical of mums, I said 'Nathan, who's shoes are those?' He had a big grin and said 'Aww, Mum, they're no one's.' So I lay on the lounge for hours waiting for the no one to come out. "I had to go outside and when I came back again the bedroom door was wide open and no one was around. Nathan said 'It's OK, Mum, Suzie will be back soon to meet you.' She was beautiful." The past year has been incredibly hard for the whole family, Nerida said. "His sisters, Lucinda and Emmalise, miss him terribly for his support. He was always on the phone asking what we were doing. We were a very close family. All decisions were made between us. "Through this, faith has played a big part in coping with the loss of a child. He was always warm and caring. He never liked to see anyone upset," she said. "We are very proud of Nathan's achievements in his short life. "He had a very successful bakery and 80 head of cattle, which we will continue to grow for him. We hope Nathan will always be remembered for his kind and loving heart. "Our regret is that he isn't here to complete his dreams and to watch his nieces and nephews grow." 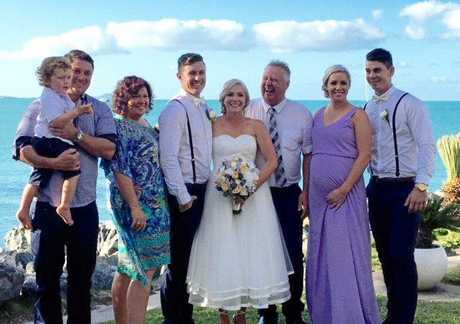 FOREVER MISSED: Nathan Spoor, pictured with his family at his sister's wedding, will be remembered for his warm smile and compassionate nature. WHERE do I even begin to find words worthy of our Nath? My truth is best told when I speak directly to Nath, thinking of him grinning so wide his eyes crinkle, reassuring me "everything's going to be OK Missy, promise". To me, you are the perfect man. You have a treasure within you that is infinitely greater than anything this world can offer. It is impossible to list all the ways you made the world a better place, but bear with me as I try. Your ability to light up any room you entered with that big cheeky grin of yours. Your soul shining so brightly upon everyone you met, making us all feel like the most important person in your world. A feeling I struggle to capture with words, but one that those lucky enough to be loved by you will carry with us forever. You were tough when you needed to be, but your kindness and empathy were never too far away. You always acted with integrity, guided by a moral compass that meant you genuinely cared about others, often times putting their needs above your own. Your friendship with all the boys meant the world to you. You were so loved by them, and you loved them so in return. You believed in yourself and those you loved so fiercely that you made us all feel as though anything was possible. How lucky you always were to be surrounded and loved by such a close and loving family unit. How lucky I have been too, to be so warmly embraced and loved by them for close to two decades. I know how much you loved and cherished your family and becoming an uncle was one of your proudest moments. Parker, your ever-adoring shadow on the farm to see your cows. Remi Rose and Dallas will grow up with stories of Uncle John, his love for them shining through our memories. Nath, you taught me that anything was possible. Your love for life and your incredible passion was an inspiration, and the driving force for us to start the bakery back in 2004. We worked so hard together to set up Rise. We were young and we learnt together along the way. I'll never forget how our old oven packed it in and we had to sell our boat to get a new one. 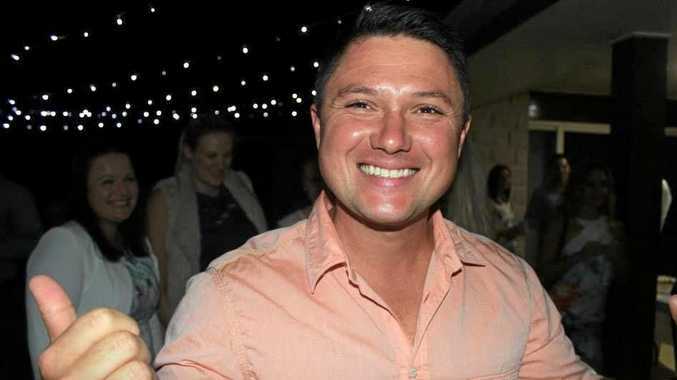 We had such incredible support from our families, friends and from Glen Toll and Marcus McLellan, always in our corner ensuring we didn't get swept up in the fun of it all and neglect the serious side of our business. You loved the Rise crew and customers, and you were over the moon when you bought the bakery back from your Mum and Dad. I am so proud of how hard you worked to make this happen. It was such a joy to work with you again on the bakery and other projects. Our team in Perth could feel your enthusiasm from the other side of the country as we worked with you on other developments for the bakery and other projects. 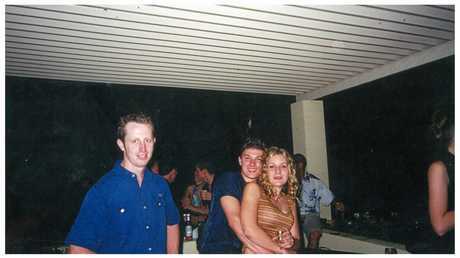 You were an amazing business person, your instinctive entrepreneurial ways evident when we met in the year 2000 and started dating when you were 17. You and I sitting down at the beach late into the night talking about opportunities and all the adventures this world had to offer. You lived with so much passion and you dominated anything you put your mind to. From business to motorbikes, to golfing, fishing - the list is endless. Living large in every area of your life, holding your own in the business world, yet still the last one standing at the pub. Emmalise, Nathan and Suzie on the day Nathan and Suzie sold the bakery to Keverne and Nerida. It is an absolute privilege to be loved by you, Nath, and to love you. We weren't perfect, in fact we were messy at times. But ours was a connection that only we could understand, a story that stretches to the farthest corners of more than 17 years. A story of unconditional and infinite love that was magnetic from the moment we met. We were apart for some years, but still very much a part of each other's lives during this time. We spoke multiple times every day, sharing business ideas and inspirations, laughing about weekend shenanigans, discussing the mundane logistics of life, and the joys of family, friends and everything in between. Often confiding our greatest fears and deepest secrets. You have always known me better than I know myself. Distance means little with someone who means so much, and we travelled the country often, meeting whenever the opportunity presented. Our love, undaunted by the waves of the ocean or the dry expanse of the land that may have been between us. We were so excited for what lay ahead. The words you said to Travis before you got into the boat are wrapped warmly around my heart, and their truth will stay with me forever. I miss you so so much, and there's not a minute of the day that passes that you're not in my thoughts. I realise now the only time we're guaranteed is this time, this moment right now. I know you are showing me this, I can feel you in my heart and I will never let you go. I don't understand life without you and I'm not sure I ever will. But I will try and draw from the strength I know you saw in me, to try keep living with the qualities that you loved about me. You're going to live forever in me. My lighthouse, always showing me the way. Nathan Spoor and Suzie Thomas celebrate Nathan's 18th birthday. I don't think success should be measured by wealth, fame, fortune or title, I think success is measured by the love people have for you. That is real success. Nath you are the most loved man I know and that love that so many people have for you will live on in all of us forever.